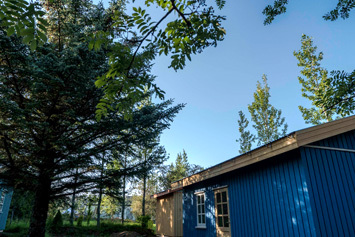 Two charming wooden cabins on a private property surrounded by a semi-wild garden. 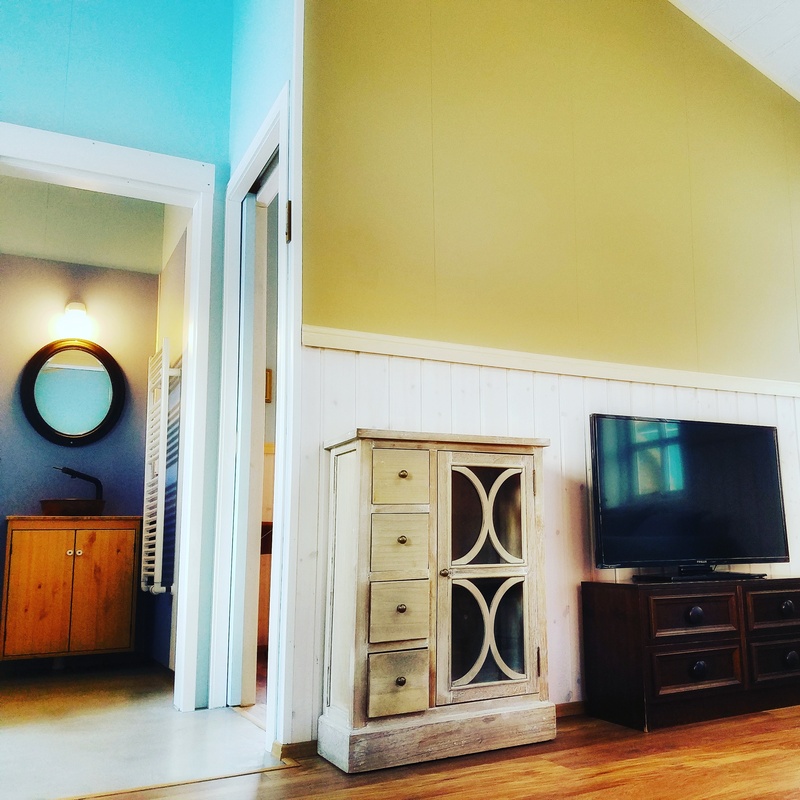 Both houses have a bedroom with a double bed (plus a bunk bed), a bathroom with a shower and a living area combined with a fully equipped kitchen. The living area has a pullout sofa bed. Each cabin is 36 sqm and can accommodate max 5 people. 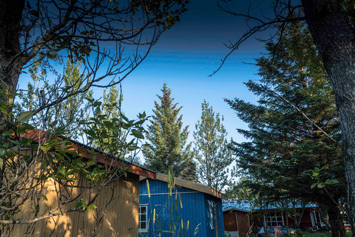 Both cabins have a private entrance doorway as well as a door that opens into the backyard. There are windows on every side – and a skylight in the living area. The floors are heated (geothermally, of course). Excellent for family stay or as a romantic getaway. 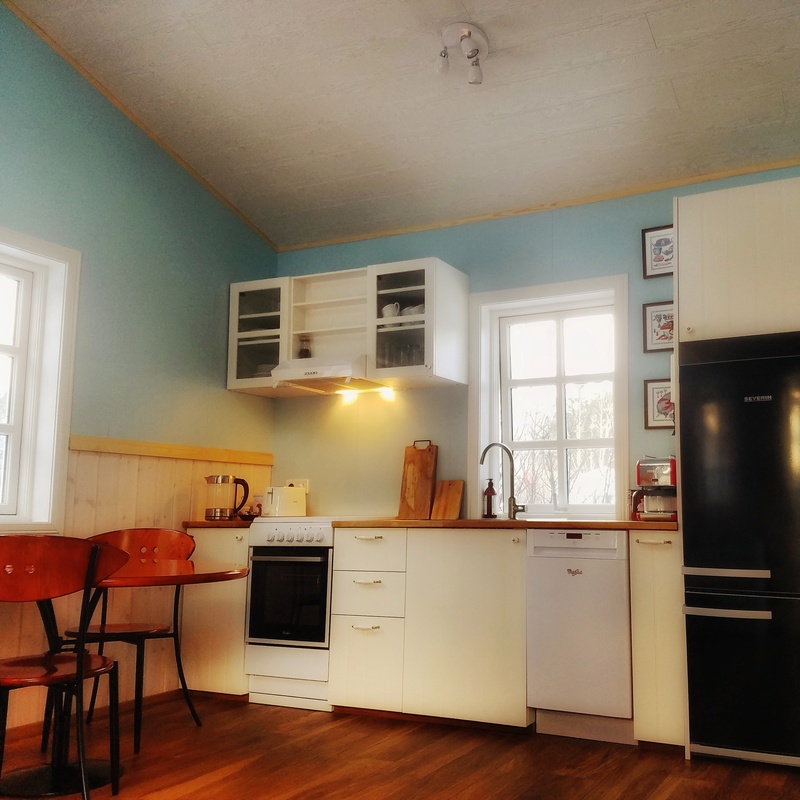 From the cabins there is easy access to the major day tours in Iceland. 40km South of Reykjavik, a 45 minute drive along National Road nr.1. Location on the Golden Circle enables you an early start for tours such as The South Coast, Golden Circle, Laugarvatn Spa and Secret Lagoon – which are all the top day attractions in Iceland. There are horse rentals close by and the Reykjadalur hot river hike is almost at the front door. From the cabins you can quite easily walk to the famous natural baths and back in one day. Our town, Hveragerdi (literally, Garden of Hot Springs, but also nicknamed The Flower Town and The Town of Artists) is located on National Road nr.1. 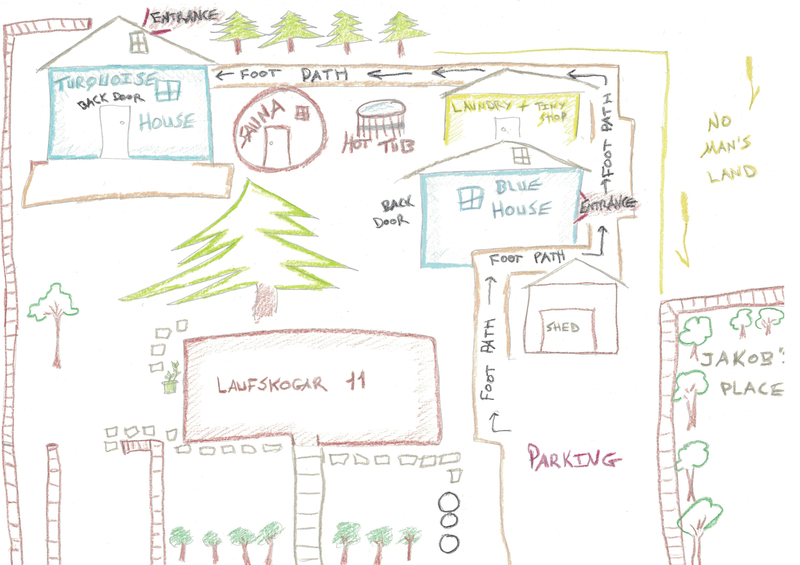 Our address is: Laufskogar 11. A private car is recommended if you want to explore the surrounding area. Also there is a public bus from Reykjavik (Mjodd). The name of the local bus station is: Shell, Hveragerdi. 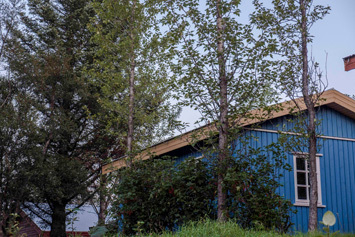 A community of around 2500 souls, Hveragerdi is known for being the first place in Iceland where people started to use geothermal energy for green house agriculture. Our town is the only place in Europe where bananas are grown, although sadly not enough to be marketed and sold. 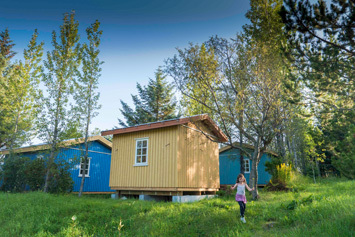 Hveragerdi is a charming village with green public areas, large private gardens that are interesting to look at, numerous geothermal springs, greenhouses, family run restaurants – one of them specialised in earth cooking, two great geothermal pools, the Geothermal Park within short walking distance from the cabins and a grocery store/wine shop/bakery/tiny earthquake museum – all in the same building (15 minute walk from Backyard Village). 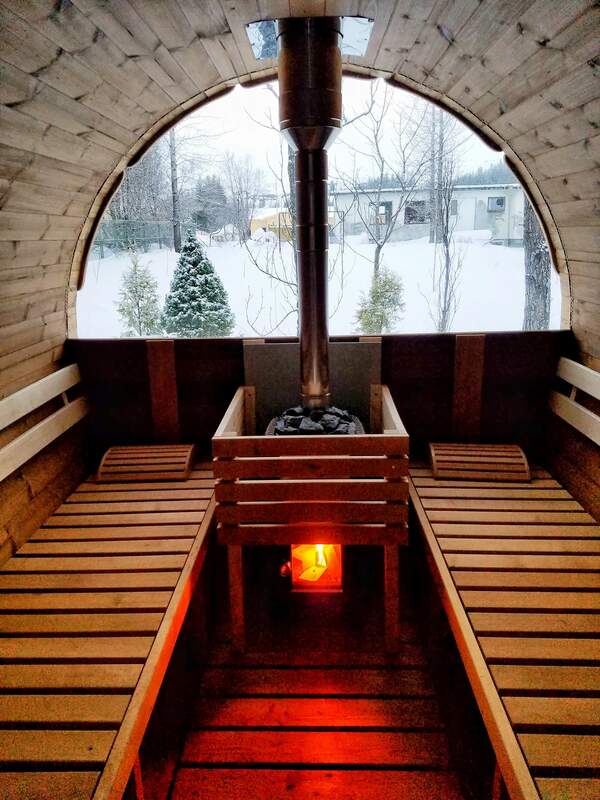 We have a beautiful modern WOOD FIRED SAUNA. The sauna is a good place to unwind, after a long hike for instance. It takes about 20 minutes to warm up the sauna, and we are happy to guide and assist you. Children should only use the sauna accompanied by a guardian. People with a heart condition, high blood pressure or respiratory problems should not use the sauna. THE LAUNDRY CABIN has a washer and a dryer. There is also a storage for outdoor clothes as well as extra linens, towels, etc. In a corner there is the tiny self-service shop, where you can buy locally hand made stuff; soap, jam, wooden crafts as well as books – used and new. 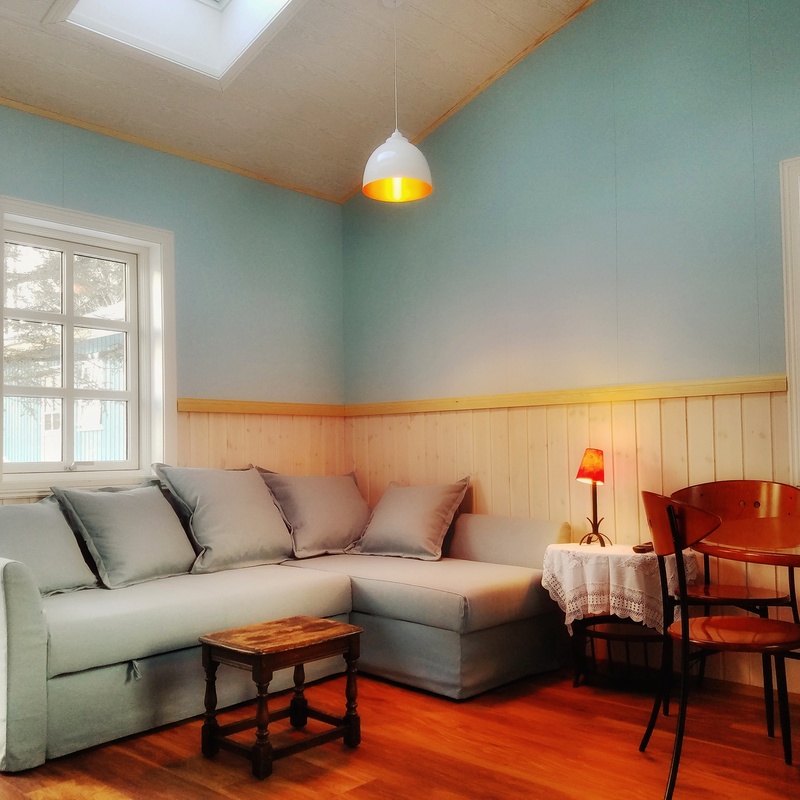 A chair and a small table is by our favourite window, where you can fold laundry, do some writing or just look at the nearby Mount Hamar while you wait for the dryer to finish. Beside the sauna there is A HOT TUB. Another great way to unwind and a superior method to keep warm in any weather while looking at the sky. Also perfect for those who can´t tolerate the heat of the sauna. Children should only use the hot tub accompanied by a guardian. 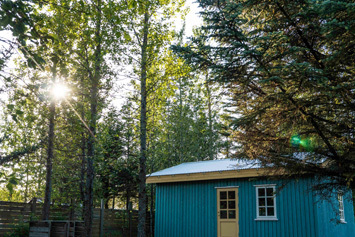 An OUTDOOR SHOWER is affixed to the Laundry Cabin. It is invigorating to take a cold shower in between sauna sessions. There is free HIGH SPEED WI-FI and a SMART-TV. We also have a TRAMPOLINE. For the kids and/or the child inside every one of us. And there is the unique possibility of arranging DINNER WITH THE HOSTS for perhaps an evening of planning, recommendations and local knowledge. 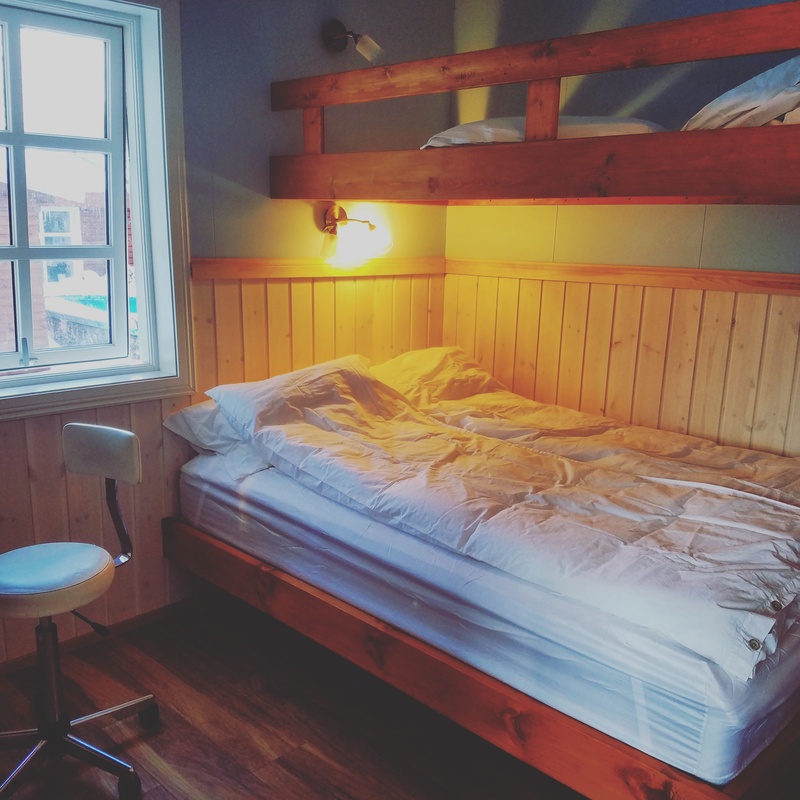 - Double bed, queen size, 140cm, with a luxury mattress and extra comfortable hemp bedding from Dirty Linen, Sweden. Close by there are plenty of horse rentals. Neighbouring villages also have excellent restaurants. For instance: Tryggvaskáli in Selfoss and The Lobster House in Stokkseyri. 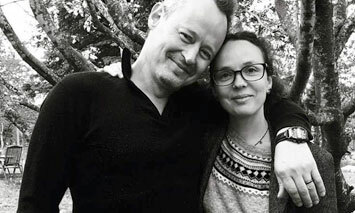 We are Marteinn Thorsson (tenderlee.com) a filmmaker, and Gudrún Eva Minervudottir (minervudottir.com) a novelist. We have a young daughter, Minerva, and a cat, Gudbrandur. Being artists can be an economically tricky affair. And since we have a nice big backyard we decided to turn a part of it into a residence, for a bit of extra income. We want to create an intimate and inspiring place of rest. So we encourage you to stay for more than one night. 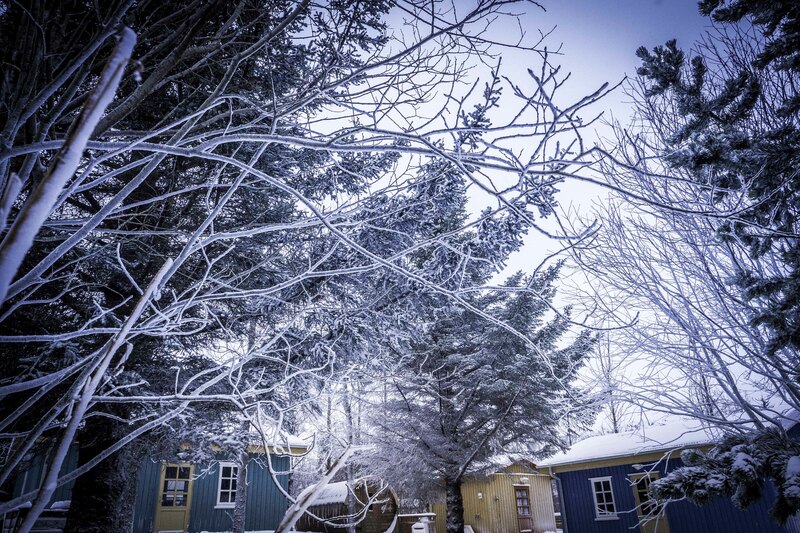 The best way to experience our beautiful country is to take it slow and notice the little things: The smells in the air, the ever-changing light, the shapes of geothermal steam rising from the ground, the rain or snow on the window, the sound of the wind, the absence of stress. 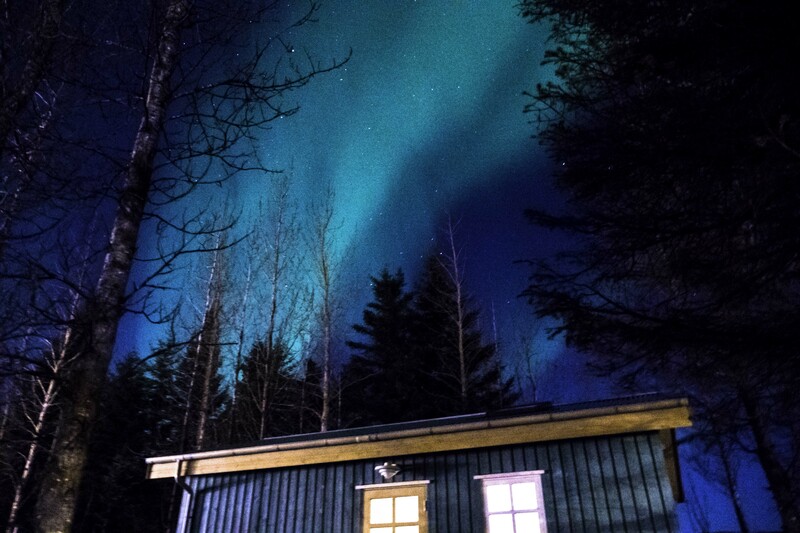 So if you want to relax, do some hiking, go on interesting day trips, cook your own meal, fire up the sauna, and get to know a bit of the life in a small Icelandic town – this should be the ideal place. Being artists can be an economically tricky affair. And since we have a nice big backyard we decided to turn a part of it into a residence, for a bit of an extra income. 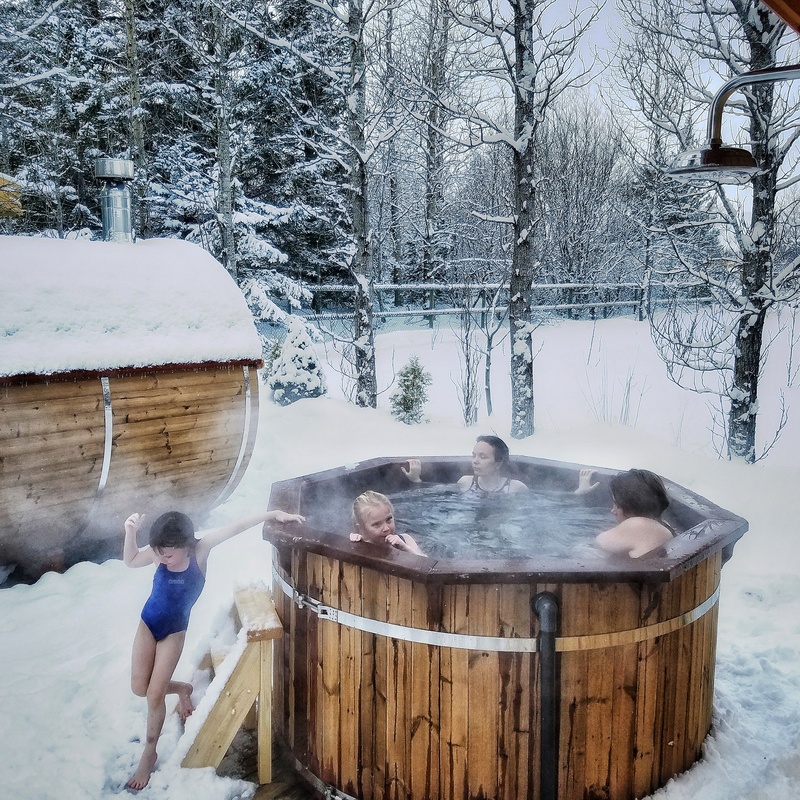 So if you want to relax, do some hiking, go on interesting day trips, cook your own meal, fire up the sauna, and get to know a bit of the life in a small Icelandic town – this place is ideal. Includes a washer and a dryer. There’s also storage for outdoor clothes as well as extra linens, towels, soaps, etc. A chair and a small table is by our favorite window, where you can fold laundry, do some writing or just look and reflect or meditate while you wait for the dryer to finish or someone comes knocking. There is no bathtub but there is a wonderful shower. Powered by Hveragerdis hot water—it's straight from the earth below you, a hot water spring! There’s also the OUTDOOR SHOWER (affixed to the Laundry Cabin). It’s invigorating to take an ice-cold shower between sauna sessions. A WOOD FIRED SAUNA is on the premises. The sauna is a good place to unwind and warm up the body and tired muscles (after a long hike, for instance). It takes about 20 minutes to warm up the sauna. Firewood is in a box beside the sauna. Take your time and enjoy. Please note that people with a heart-condition, high blood pressure and/or respiratory problems should not use the sauna. Also that children should only use the sauna accompanied by a guardian. A HOT TUB is also provided for. It’s another great way to unwind and reflect and perfect for those who can’t tolerate the heat of the sauna. Please note that children should only use the hot tub accompanied by a guardian. A fully operational stove with an owen, a fridge, coffee maker, a kettle, etc. Once we have our chickens (Summer, 2018), you are more than welcome to help yourself to some eggs for breakfast (if the chickens are co-operating). We also have a TRAMPOLINE (a favorite of Minerva and her friends). There’s free HIGH SPEED WI-FI and SMART-TV with youtube and Netflix buttons. Please select the dates for your stay below! GPS Points N64° 0' 10.558" W21° 11' 38.027"